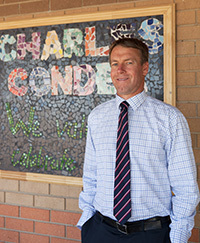 Welcome to Charles Conder Primary School. This school’s vision enables our community to work towards common goals ensuring children are our focus. The manifesto is embodied by ‘Know the Child – Grow the Child’. Charles Conder Primary School has a strong commitment to providing a safe and harmonious school environment where successful relationships thrive. The strength lies in the close partnership between students, staff, parents and the wider community which is highly valued to us all. We promote and develop positive and respectful relationships. The school motto is: Commitment to Excellence – in a caring, cooperative, purposeful and success-oriented environment. At Charles Conder Primary School our community believes in the manifesto of ‘Know the child, Grow the child’. We incorporate a holistic and collaborative approach to teaching and learning where students belong, feel safe and supported and have high expectations for success. Learning is student centred, differentiated, authentic and inquiry driven. Teachers analyse data to identify purposeful, personal learning goals allowing for targeted teaching and learning. Feedback and reflection facilitates ongoing learning, ensuring students feel empowered to take risks, extend their thinking and develop a growth mindset. At Charles Conder Primary school every student is learning and achieving as part of a shared partnership between school and home. As a community we build healthy relationships through trust, respect, support and encouragement.